When it comes to getting great results online, our affordable SEO services look at more than just links. A large part of SEO focuses on ensuring that the content is understood not just by people, but also by Google itself. Search engines are still what determines the results, so it is important that they understand your content as broadly as possible, so it can link to the relevant search queries more efficiently. This is where schema microdata comes in. These provide additional content within the websites coding or HTML, allowing Google to better understand what it is each page is describing. 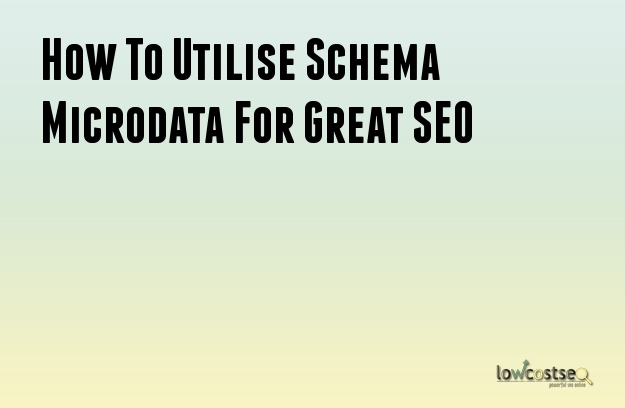 Here’s how to use scheme microdata to get better SEO results. At the score of schema data are the various types or classes used to define something. This is vital when you consider that many words have more than one meaning. For example, “jumper” is both a Hollywood movie and an item of clothing. These are very different items but, without context, Google can’t properly tell. Using schema data classes helps clarify this. A jumper would go under a very different class to a film. The latter could be a “movie” filed under “creative work”, while a jumper could be clothing under a “product” type. Straight away, this would allow Google to split the results into two, so a search for “jumper movie” would not involve any clothing stores properly indexed with microdata. Another thing schema data can do is help separate sections into relevant pieces of information. If you’re focusing on a given topic, you like have different sections focusing on different areas. While you can use simple tags, as mentioned above, or you can use more advanced options. For instance, you can use itemscope tags (in html) around specific areas to indicate the data held within is about a specific product, service or event. This helps search engine’s find the relevant information, which is useful for people with specific searches and a need for specific information. Furthermore, many of the stars, rating and additional info seen on SERPs (Search Engine Results Pages) actually come from schema data. Google already has a markup helper to help generate much of this structured data, making it easier than ever to help get the right information across. If you’re trying to sell or advertise a specific item, microdata allows you to ‘mark’ your web content as such. This is the difference between an actual book, and a website that merely refers to the book in passing. This is the same for events, services and other actionable objectives. If your competitors do and you don’t, than an online user might not even notice what you’re offering at first glance, since the SERP will favour properly marked pages. There are many uses and benefits to microdata, but we’ve mentioned some of the most effective parts for a great SEO service. However, one thing that many people don’t consider is that using this data helps you to focus on your website by narrowing down the content. Consider any webpage and what it’s relevant content is – it should ideally focus on one thing only. If not, you would have to add various titles and microdata to clarify what it is. The fact is, someone visiting such a page would find half the content irrelevant, so perhaps its better to have the content on two different pages as a result? Microdata helps keep things simple and, similarly, keeping things simple helps to make effective content that readers enjoy and click for.